(Nanowerk News) Scientists at the University of East Anglia have made an important breakthrough in the quest to generate clean electricity from bacteria. Findings published in the journal Proceedings of the National Academy of Sciences (PNAS) show that proteins on the surface of bacteria can produce an electric current by simply touching a mineral surface. 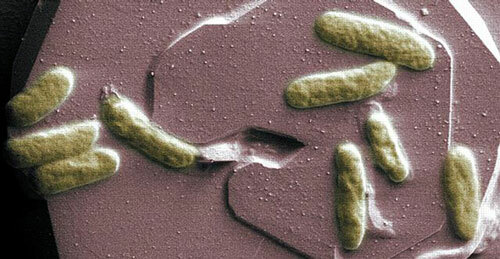 Shewanella oneidensis (pictured below) is part of a family of marine bacteria. The research team created a synthetic version of this bacteria using just the proteins thought to shuttle the electrons from the inside of the microbe to the rock. “Our research shows that these proteins can directly 'touch' the mineral surface and produce an electric current, meaning that is possible for the bacteria to lie on the surface of a metal or mineral and conduct electricity through their cell membranes.